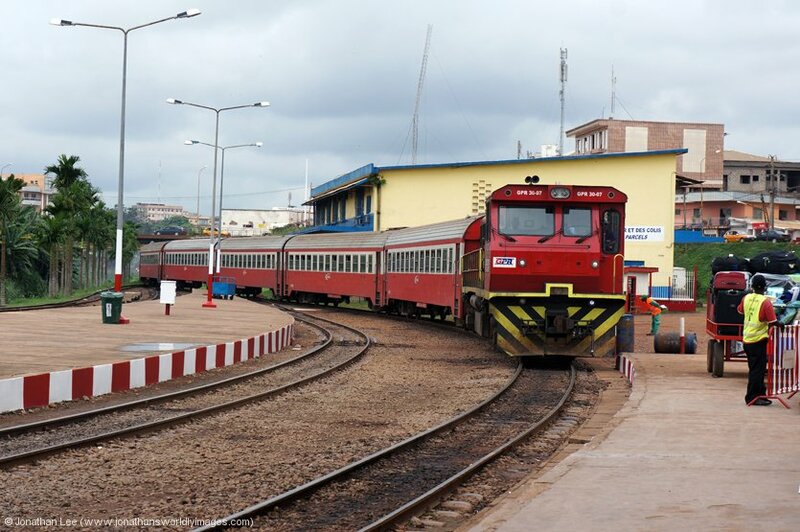 There are no through trains from Douala to N’gaoundere and a change is a necessity in Yaounde but do not rely on making the connection from the 1445 Douala – Yaounde Intercity into the 1910 Yaounde – N’gaoundere overnight train; I saw it make by minutes and miss by a good while in the space of a few days! Tickets can be purchased at CamRail stations, which can be a bit of an ordeal at times, but is pretty straightforward if you locate the ticket window you require to purchase your tickets from; which are clearly marks and advertised. 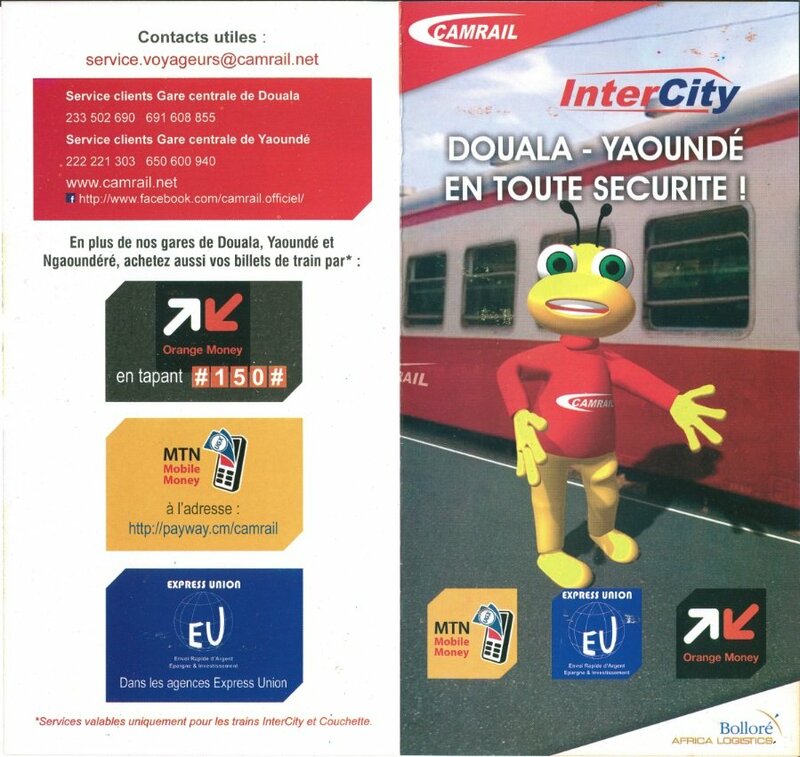 At Douala there is plenty of space inside the station building and we had no problems locating the window of buying our Intercity tickets at, and there are different windows for the different classes of travel. 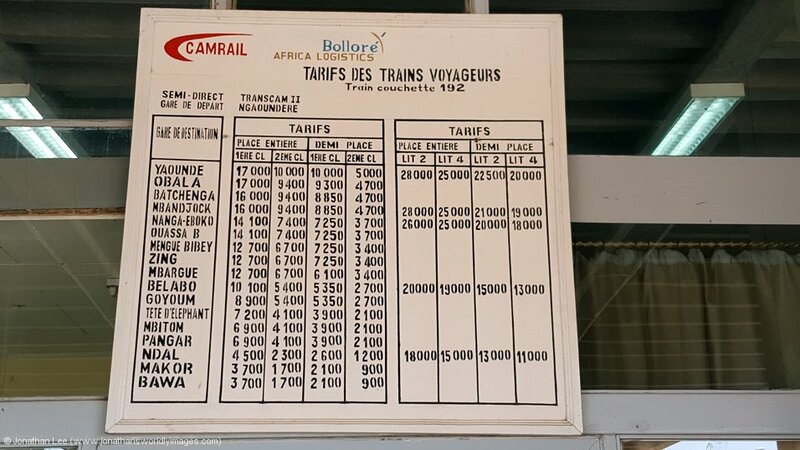 At Yaounde tickets for all trains and classes, with the exception of sleeper tickets for the N’gaoundere train, are bought from the ticket windows and are clearly labelled as to which window for which trains and ticket type. 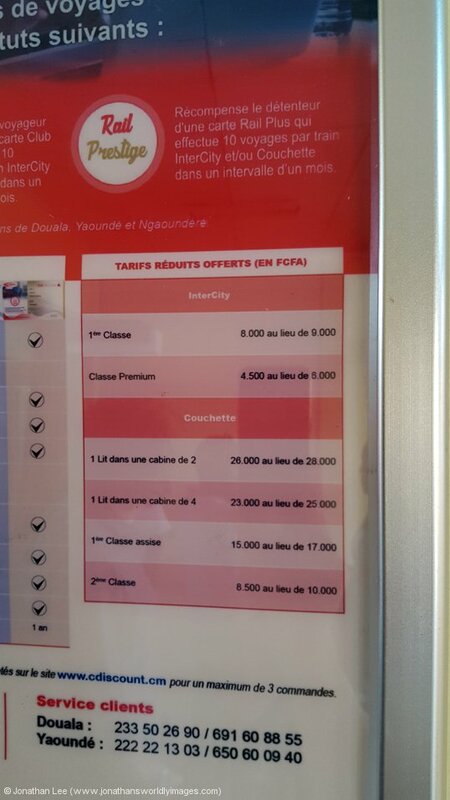 Tickets for the N’gaoundere sleeper coaches are bought from the information office, which is to the left of the ticket windows and is also clearly marked. The latter does not open for business until 11:00. 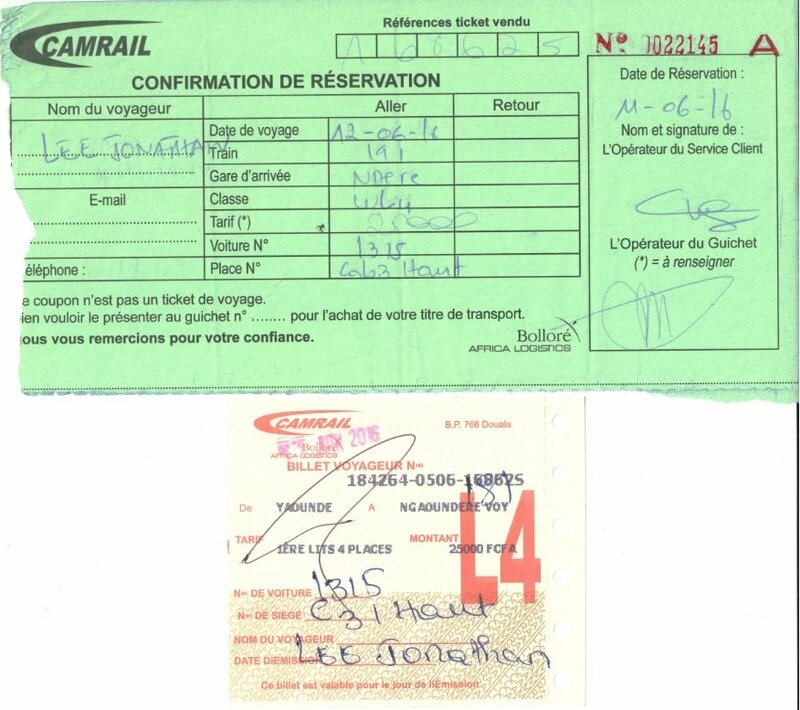 Once tickets are purchased for the N’gaoundere train (I think only in the sleepers and premier class seats) you are given a reservation receipt, ensure the date of travel is correct. Once all is well tickets are then paid for upstairs, with the steps leading up being directly opposite the information office. There are two windows, one for the premier class seats and one for the sleeper coaches; queues at both were calm and dissipated quite quickly. 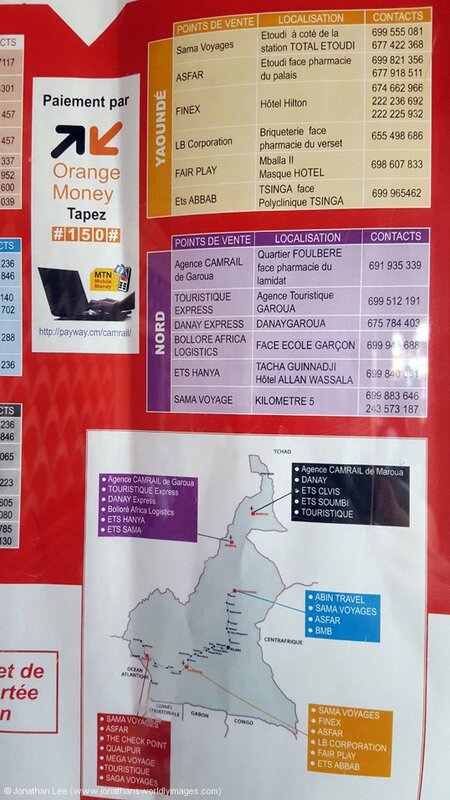 At N’gaoundere advance tickets are purchased in the right hand office (as you look at the station front, to the left of security and the station entrance) and tickets for that day (or if paying for a ticket for that day like we were) tickets are purchased in the left hand office. 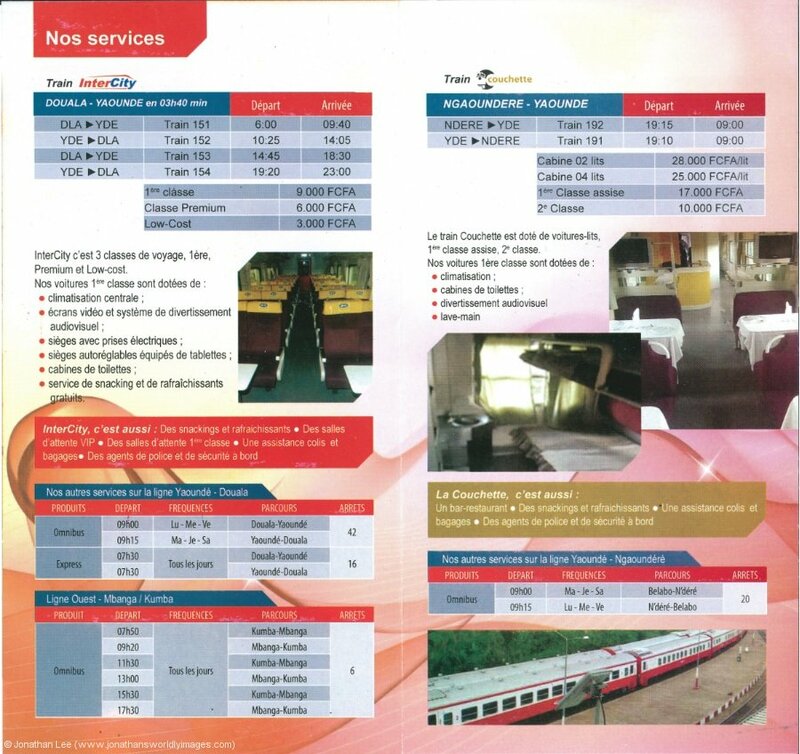 Of note is the fact that you can’t seem to buy return tickets but they can be reserved and you pay for these when you get to where you’re going; like we did for our return N’gaoundere – Yaounde tickets; at N’gaoundere. 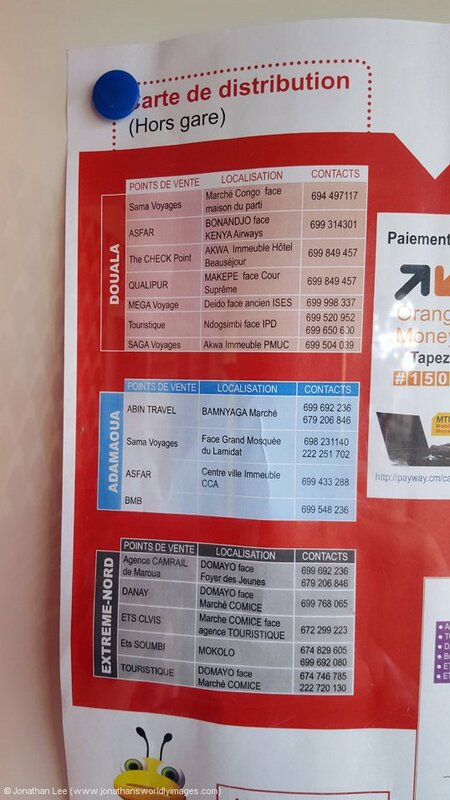 Camrail now contracts out some of the ticket selling and advertises full lists of ticket agents selling Camrail tickets in each city; some of which aren’t even connected by rail. 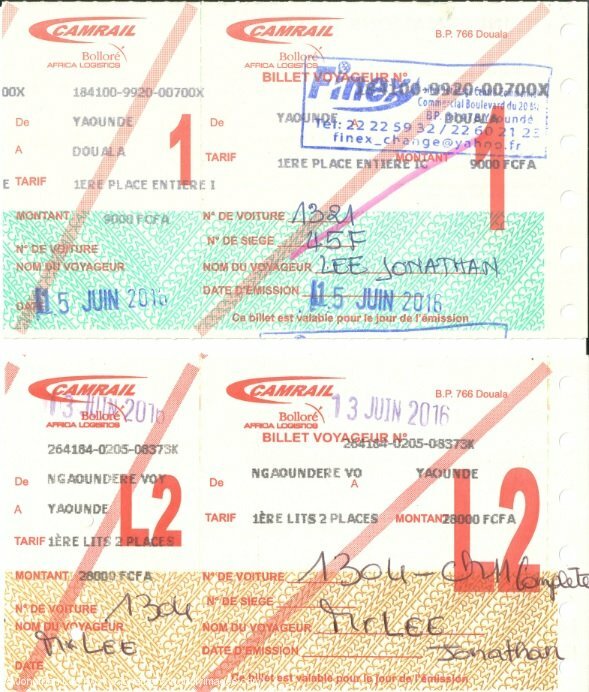 I used one of these in Yaounde, to save a walk to the station again, and had the tickets in my hand within 5 minutes; there was no queue, both the reservation and ticket are written out by the same person and paying for the ticket was done while it was being written out; all within feet of the desk; and what’s more the tickets cost exactly the same as they would if you bought them direct from CamRail! I highly recommend using an agent if there’s one near where you’re staying. 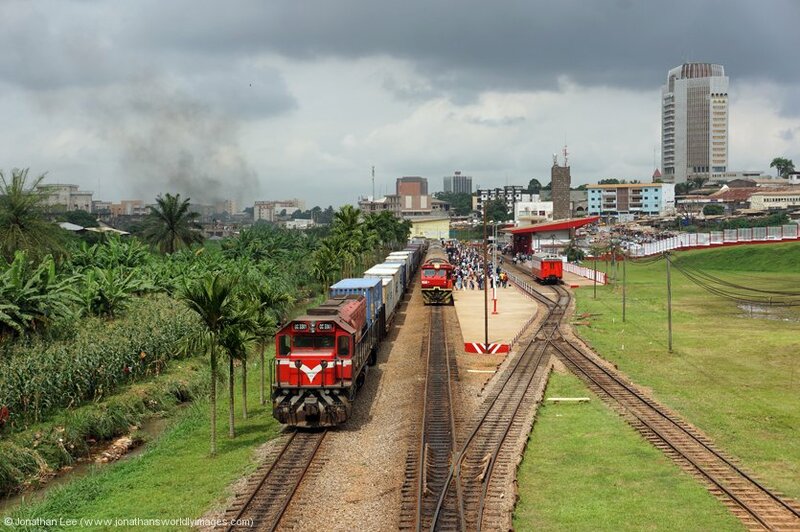 Generally the line-speeds in Cameroon seem to be quite decent but be prepared for a rough ride as the new Chinese stock CamRail has is less than ideally suited for the trains they operate. While the interiors are good, the couplings aren’t and the journey from Yaounde to N’gaoundere (if you’re near the ends of a carriage) is shocking in both the rough ride stakes and the noise stakes. 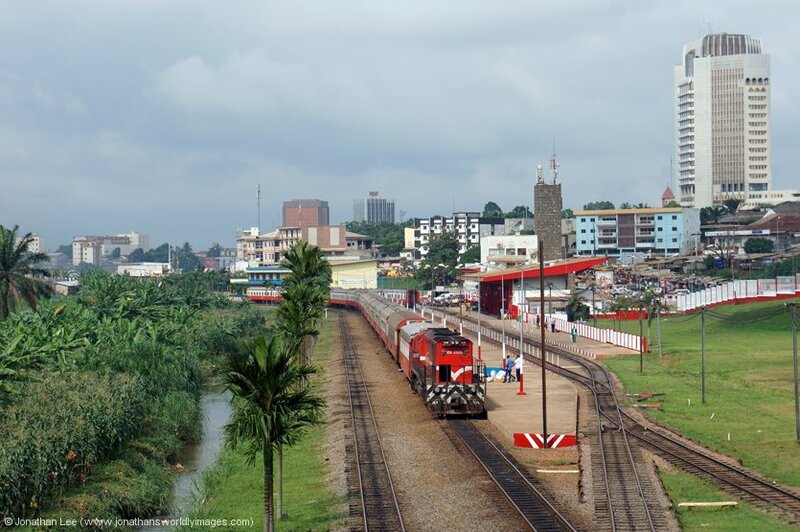 This is the same for the Douala to Yaounde Intercity services as well; but don’t let it put you off as the scenery seen from both is excellent. Unfortunately though, timekeeping on the N’gaoundere services isn’t that great and in the three days we saw the inbound arrival from N’gaoundere it was 20′ late, 3h45m late and the day we arrived on it 5h50m late! Common user? We only saw them on freight workings. Common user, seen on both freight and one was working the Yaounde – N’gaoundere circuit, going out and back at least twice while we were there. 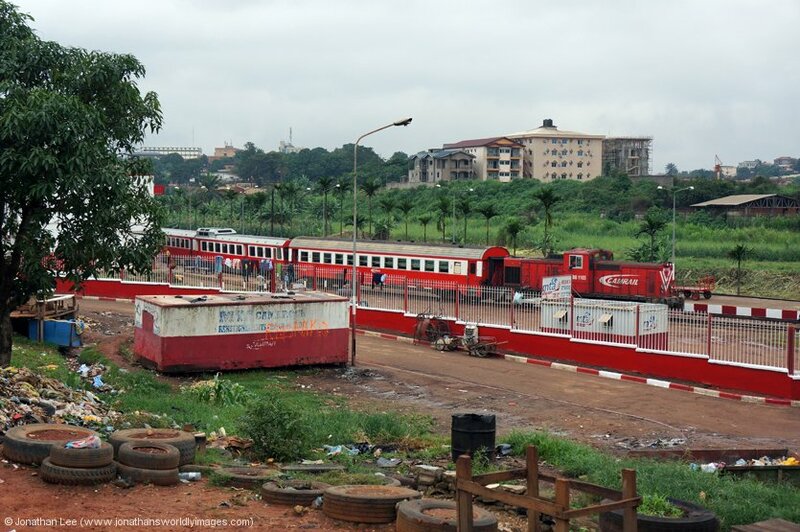 Common user, with GPR30-07 working the Douala – Yaounde Intercity trains for the whole period we were in Cameroon; others were seen on freights anywhere from Douala to N’gaoundere. 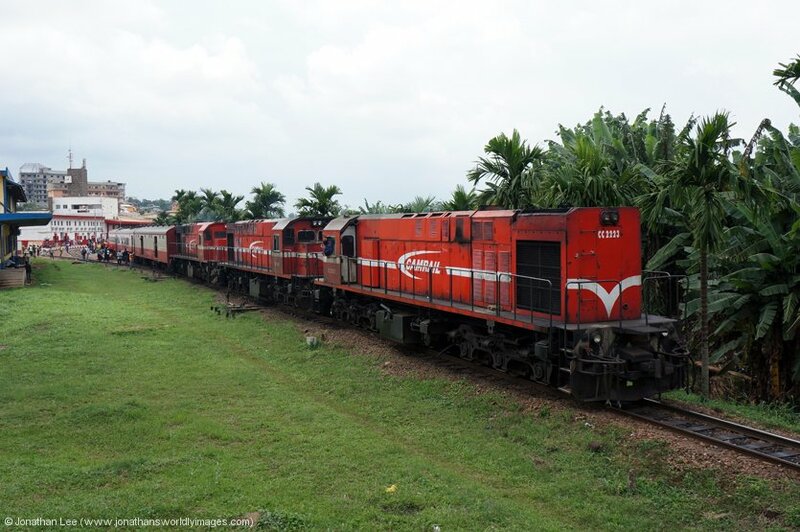 Used for shunting locos countrywide and also for the Douala – Yaounde Express trains; possibly also for the Mukba – Mbanga service?